Shipping cost to be paid for by purchaser. - UK (standard first class) - £4.00 for 1-3 discs, £6.00 for 4-7 discs. Recorded delivery costs an extra £1 but is strongly recommended for any orders totalling £20-50, as standard first only covers up to £20 in the event of loss or damage by the postal service - if you don't pay for this service, it's at your own risk. Similarly, orders above £50 are only fully covered if you use special delivery (an extra £6), so again, it's at your own risk if you choose to use standard first class. For high value items I reserve the right to insist on special delivery for shared piece of mind. - Europe (airmail, no signature) - £7.50 for 1st, then £1.50 for each shipped with 1st (inc. Double LP/ 12"s*). - Rest of World excluding Australasia (airmail, no signature) - £10.00 for 1st, then £3.00 for each shipped with 1st (inc. Double LP/ 12"'s*). - Australasia (airmail, no signature) - £11.00 for 1st, then £3.00 for each shipped with 1st (inc. Double LP/ 12"'s*). UK: £2.00 for 1-3 x 7" singles, £2.50 for 4-6 x 7" singles, £4.00 for 7-14 x 7" singles (more than 14, please ask for quote). Europe: £5.00 for 1-3 x 7" singles, £6.50 for 4-6 x 7" singles (more than 7 singles, please ask for shipping quote. Rest of World (except Australia + New Zealand): £6.00 for for 1-3 x 7" singles, £8.00 for 4-6 x 7" singles (more than 7 singles, please ask for shipping quote). Australia + New Zealand: £6.00 for 1-3 x 7" singles, £8.50 for 4-6 x 7" singles (more than 7 singles, please ask for shipping quote). * Please note: Double 7"s are counted as a purchase of two discs in shipping calculations. If you buy a combination of 7" and 12"/LPs, I'll be happy to quote a price that reflects shipping and material cost. As a rule, I don't profit from shipping fees. These rates are for standard shipping, without signature required on delivery. Where your purchase is £20 or over, or whatever the cost if it's going to be shipped to some countries, I strongly recommend that you pay for fully insured shipping. I am happy to price up insured shipping options and let you know the cost - please keep in mind that I'm not the one who is actually transporting the items but I do always obtain a proof of posting when I ship. Conservative grading - A-side Daft Punk mix plays VG+ or better (just has a visible scuff at end, but careful play testing reveals that this doesn't seem to be audible). 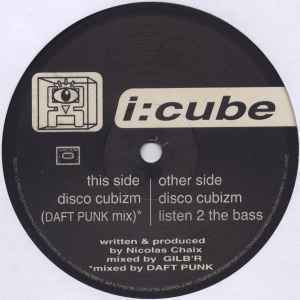 B-side has some groove wear at the end the original mix of Disco Cubism but only minimal noise. Clean lablels. Generic sleeve has a partly removed sticker on - will replace on request.